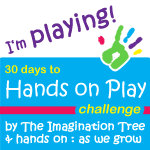 I have to say, I’m loving the 30 Days to Play Hands On Challenge. It’s helping me in ways that I didn’t anticipate already, and this is only day 4. Yesterday, day 3, the challenge was to play with blocks. For us, this was awesome. Norton has a decent collection of blocks and loves to stack his Mega Blocks. We find them to be a reliable standby for whenever we have some toddler play on the floor. Sometimes, a little help with toddler play ideas can be good, though. This time, we didn’t just play with the blocks. I sat with Norton and tried to get him to sort them into colors. That was marginally successful… and I think he said “green.” (It was pronounced “nee”, but considering “dog” comes out “gah”, it’s not out of the realm of possibility.) Still, sorting the blocks wasn’t his favorite thing to do. But building those blocks up (which was one of our “homework words” from the speech pathologist) was much more fun. Norton and I sat down on the floor and we built a tower that was taller than his head. We haven’t made a lot of headway in the toddler talking department with that particular word, but he understands it. That’s more important than being able to repeat it, I think. All in all, this was a good round of toddler play time for us. I look forward to more of it in the future!